A substantial proportion of people living with chronic pain report the use of alcohol to self-medicate their pain. 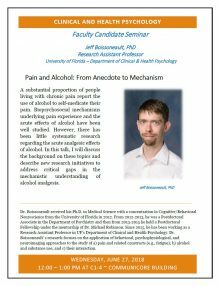 Biopsychosocial mechanisms underlying pain experience and the acute effects of alcohol have been well studied. However, there has been little systematic research regarding the acute analgesic effects of alcohol. In this talk, I will discuss the background on these topics and describe new research initiatives to address critical gaps in the mechanistic understanding of alcohol analgesia. Dr. Boissoneault received his Ph.D. in Medical Science with a concentration in Cognitive/Behavioral Neuroscience from the University of Florida in 2012. From 2012-2013, he was a Postdoctoral Associate in the Department of Psychiatry and then from 2013-2015 he held a Postdoctoral Fellowship under the mentorship of Dr. Michael Robinson. Since 2015, he has been working as a Research Assistant Professor in UF’s Department of Clinical and Health Psychology. Dr. Boissoneault’ s research focuses on the application of behavioral, psychophysiological, and neuroimaging approaches to the study of a) pain and related constructs (e.g., fatigue); b) alcohol and substance use; and c) their interaction.